Why wait for Windows 7 - install its best features right now! Microsoft's CEO Steve Ballmer recently told the world that "Windows 7 will be Vista, but a lot better." That sounds great, unless you bought Windows Vista believing that it was 'a lot better' than your version of XP and just found out that you may have to wait until 2010 to get the improvements that you were expecting in the first place. But another way to read Ballmer's comment is that Windows 7 will be 'Vista plus fixes' rather than wide-ranging core changes. If that's true then there's no need to wait for these improvements. Nearly all of the Windows 7 features that we know about so far can be delivered with a few OS tweaks and third-party tools for free. In some cases, you can do them even if you're still using Windows XP. Issues with Windows Vista generally begin when you turn your PC on and discover that it takes longer to start up than your previous XP system did. That's disappointing, especially as Microsoft claims that new Vista technologies should improve boot times. Apparently Windows 7 will seek to dramatically reduce the number of services started when your system boots, but you can do this yourself by disabling the programs that you don't need. To declutter your boot process, open 'services.msc' and scroll down the list to see what services are currently selected to launch at startup. It's quite unlikely that you'll need the Distributed Link Tracking Client (which tracks files across a network), Tablet PC Input Service or Offline Files (which synchronises files between computers) services, yet they're all started by default. Doubleclick a service and set its 'Startup Type' to 'Disabled' to reclaim some system resources. The Black Viper site gives some good advice on some other services that can be safely disabled, but we recommend you err on the side of caution, because turning off too many can cause problems elsewhere. If you don't feel a service or third-party program is essential immediately, but you're reluctant to do without it entirely, Vista also includes a feature that can delay the start up of non-critical items. This means they won't make heavy-duty use of your CPU and hard drive until after the desktop has appeared. Delay their initialisation and everything else should load more quickly. If you have an iPod, for instance, you may have the Apple Mobile Device, Bonjour and iPod services installed. Select each of these in turn, give them a Start-up Type of 'Automatic (Delayed Start)' and then reboot to see if this has improved your start-up time. You should be able to achieve even better boot times with the help of Startup Delayer, which applies the same principle to your Windows start-up programs. Is it really necessary that program update clients and webcam tools launch the moment that your PC boots? Use this program to delay them for 60 or even 120 seconds and your desktop should appear (and be usable) a lot faster. The Windows Vista interface is a big contributor to its large memory footprint and poor performance on some systems. Microsoft knows it can't add extra overheads just yet, so Windows 7's focus is on other areas. The new touchscreen features will grab the headlines, but if you don't have compatible hardware then you'll have to make do with minor tweaks to the existing layout. 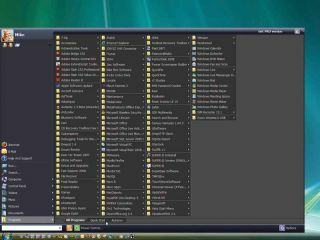 A revamped Start Menu is likely to speed up locating programs, but you can get a similar effect by using Vista Start Menu, which – despite its name – runs on Windows NT, 2000, 2003 and XP as well as Vista. Notably, this uses large icons so you can recognise programs more quickly, adds tabs for easier menu organisation, features resizable menus to avoid scrolling, has power buttons on the menu for one-click shutdown or reboot and includes a built-in command line and search tool.